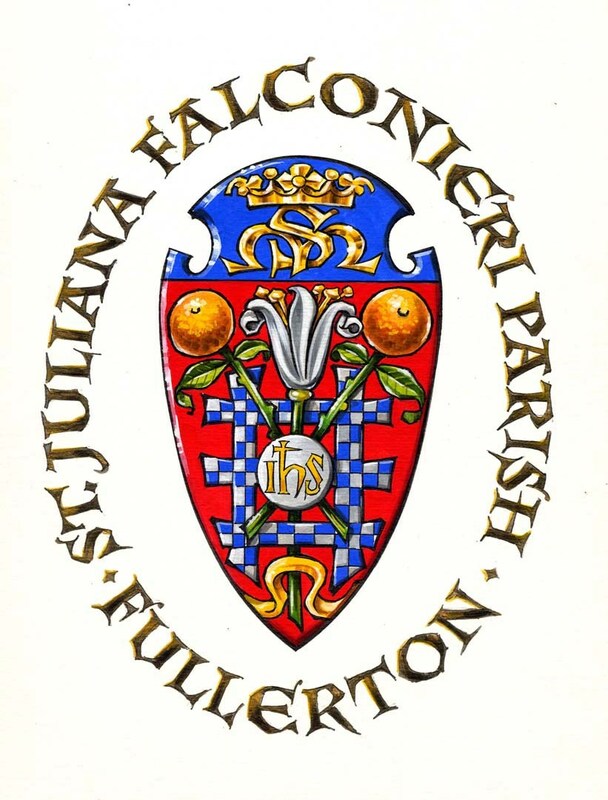 I commissioned Mr. Marco Foppoli, a heraldic artist (Google search for more information on Mr. Foppoli) in Italy to design a crest or coat of arms for St. Juliana Falconieri Parish. I asked for the crest to include as much of St. Juliana Falconieri and the Parish as it could. I asked for the Falconieri Family, the Servite Order, Fullerton, CA, some elements of our grammar school, and the Holy Eucharist to be included. This project took several email conversations to accomplish. The final design is on the front page of this bulletin and again here on this page. First we see the crest of the Servite Order set on blue in honor of Our Lady, the patroness of the Order. Juliana was already connected to the Servite Order via her uncle, Alexis Falconieri one of the Order’s Seven Holy Founders. Juliana served as the superior of the convent from its founding until her death. Second, the large part of the crest - this features two oranges for Fullerton in the Diocese of Orange – Orange County, California. The stylized lily flower between the oranges represents the city of Florence, Italy the home of both Juliana and the Servite Order. Prominent is the “IHS”, one of the symbols for Jesus Christ from the beginning of the Church. The monogram stands for Jesus Hominum Salvator – Jesus Savior of Mankind. It recalls Juliana’s love for Christ, especially her devotion to Jesus in the Holy Eucharist. Finally notice the crest of the Falconieri family itself, blue and white “checker” stair, as Mr. Foppoli describes it. On that stair you can climb to the good, to the sky, and ultimately to God! Being a Senatorial family of Florence, the Falconieri crest is researchable in medieval heraldic codexes. St. Alexis would have the same crest, indeed St. Alexis Priory at Servite High School bears the same identity on its priory flag. You could also accept that I told the artist that blue and red, the colors of the girl’s dresses, are the colors for St. Juliana School! Surrounding the crest is our identity: ST. JULIANA FALCONIERI PARISH, FULLERTON.